Tasting Mr. Deng’s Zhulu tea. This being Taiwan, the liquor was first poured into an aroma cup. I met Ren Zhi Deng at his Tianyi Tea Garden and Minsu (homestay) in Shizhuo, Taiwan the day after a typhoon had veered from the island at the very last moment. A sense of joy was palpable. The sun was beaming, and everywhere people were smiling, happy to have dodged a natural disaster. 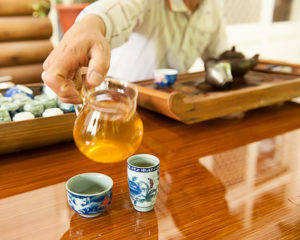 Over rounds of tea under the veranda, Deng patiently explained the nuances of Alishan Zhulu tea. 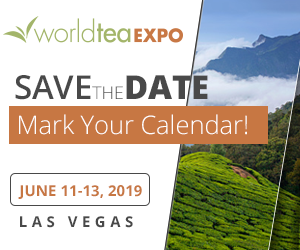 Known for its elegant aroma and sweet lingering aftertaste—floral, and when at its best, accompanied by a ripe fruity note—this high-mountain wulong is appreciated by tea connoisseurs worldwide. Not until he responded to my question of whether his ancestors were already in the tea business, did I realize that this soft-spoken gentleman, who referred to himself humbly only as the collective “us tea farmers,” was in fact a catalyst in transforming his hometown into one of the most revered tea-producing areas in Taiwan. 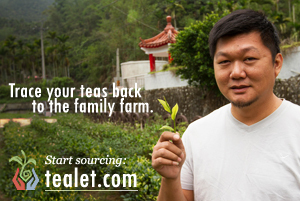 “It was purely by chance that we started growing tea here,” explained Deng. When he was a child, a handful of families in Shizhuo (Shizhao) tended a few wild tea trees, but people considered the area too cold for tea cultivation. When he was 24, a neighbor’s daughter, who had married and settled in a town at a lower elevation, told him that the inhabitants there were making a good living growing tea. By contrast, Shizhuo was in dire need of revitalization. Its farmers could hardly make ends meet with their traditional crops of bamboo shoots and lily flowers. Young men such as Deng had no choice but to move to the cities. To help farmers find alternative crops, the government also started to encourage them to experiment with planting tea at higher altitude. Tea trees are sensitive to cold and frost; young tea plants are even more fragile. That winter, every day Deng sought ways to protect the young saplings, checking if any had been damaged by frost, hoping they could make it through another night. 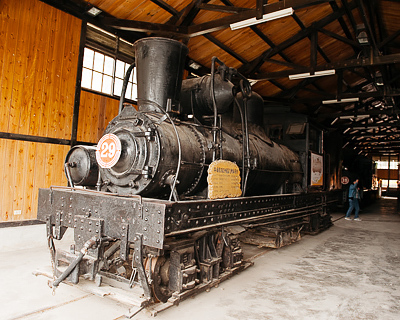 The old steam locomotive that was once used by the Alishan Forest Railway. Ever since the age of 13, Deng and youngsters in Shizhuo and further up the Ali Mountain had to travel to big cities such as Chiayi to get an education. Back then, the main form of transportation was the Alishan Forest Railway, a relic of colonial days, built by the Japanese to transport the prized cypress wood used to construct Shinto shrines. It took three hours for the slow train to cover 50 kilometers, and another hour by foot to reach home. The little tea bushes rode out the first winter. Success, however, wasn’t instant and didn’t come easy. 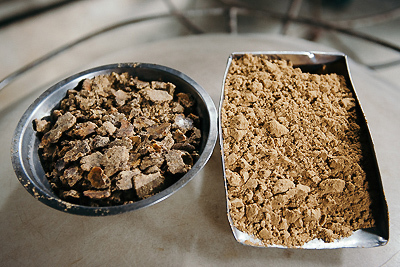 It took another five years of experimenting before Deng and the handful of tea pioneers in Shizhuo could, with confidence, inform their fellow villagers that “yes, tea can be our future.” Deciding on which cultivar to use was an early challenge. 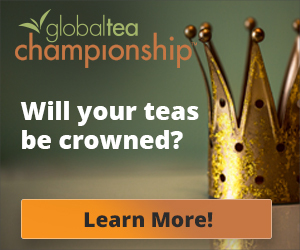 “The scientists advised us to start out with cultivar Tai Cha #12 because it’s newer and more resistant to cold. ‘If #12 can’t survive, then there is no hope for other cultivars,’ they told us. However, the tea we made initially didn’t sell well. We realized that to make the best-tasting tea in Shizhuo, we should try planting Qing Xin (Green Heart) instead,” he said. Originating from Wuyi Mountain in China, Qing Xin is a cultivar traditionally used to make Dong Ding wulong, another famous Taiwanese wulong tea. “We tried, but most Qing Xin plants died, and we could barely keep the remaining ones alive through the frosty winter. Luckily, scientists found another solution: planting #12—using it as the stock—then grafting the scion (Qing Xin) onto the strong rootstock. To this day, we carefully trim off the newly grown #12 branches around the base of the tree trunk, so that only Qing Xin leaves are left for plucking. This is more labor intensive, but we get the best of both worlds: the cold-resistant, pest-resistant #12 with its strong roots, and Qing Xi, with its aromatic leaves,” he explained. The best high mountain wulongs in Taiwan are always hand-plucked. Collectively, the farmers voted to move onward with this method, even if Qing Xin grows slower and for each harvest, the production quantity is smaller, about 20% less, than #12. 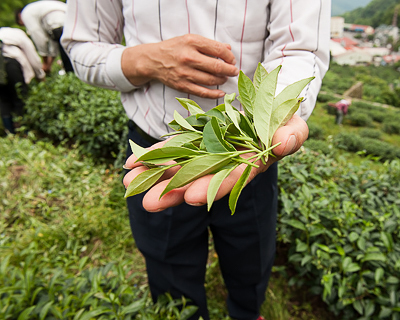 According to Deng, about 90–95% of Zhulu tea today is made with Qing Xin leaves. Cultivar was only one hurdle. Among many others was being able to afford the right equipment. 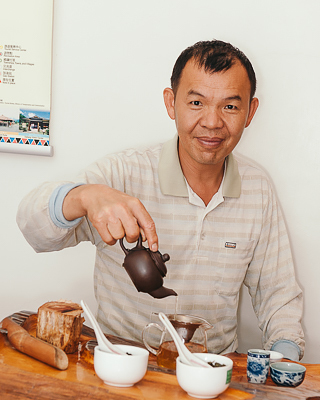 “People making teas here are locals,” said Deng. 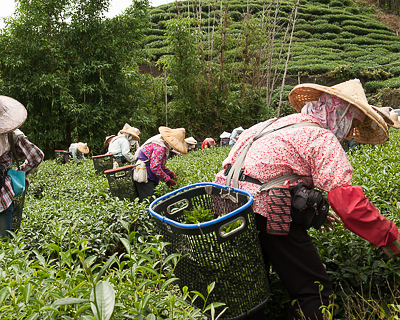 “We grew up together, played together— it’s natural that we help one another on our tea journey. Zhulu means “pearls of dew” in Chinese. For anyone who has traveled to Shizhuo and tasted authentic Zhulu tea, it’s easy to understand why this tea is so named. 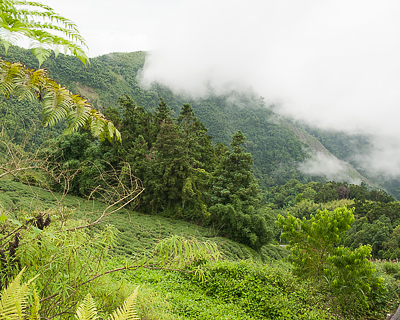 Tea masters in Taiwan and China believe that good leaves depend on the harmonious workings of three essential elements: sky, land (soil), and man. Of the three, Shizhuo and the adjacent villages near the Alishan mountain range are blessed with a one-of-a-kind “sky” due to their unusual microclimate. Shizhao approaching 4 p.m. – the first wave of fog and mist had just arrived. “We only get half a day of sun,” as the locals would explain, apologetically, to the puzzled tourists wondering why the sun had suddenly disappeared. However, the “half-day sun,” along with final roasting, is precisely what gives this tea its special characteristics of subtle sweetness and smooth finish. In Shizhuo, by mid-afternoon on a typical clear day, one can see a white dot begin to form in the distance toward the direction of the sea. This fluff of cloud then grows, slithers like a white snake, first along the lowlands, then makes its way between the mountain ridges leading to Shizhuo. By 4 p.m., the entire village is enshrouded in waves of dense rolling fog. The thick gray mist, often mixed with droplets of rain, lingers until the morning sun lifts the mist and licks the dew off the leaves. Around 10 a.m., the sky reverts to clear blue. Shizhao at 10 a.m. as the final wisps of cloud disappear. To understand the effect this reduced light intensity and accompanying lowered temperature has on tea, the closest analogy I can think of is the highly regarded Japanese tea, Gyokuro (Jade Dew). Gyokuro is shade-grown: about three weeks before harvesting, farmers erect a canopy over the tea plants to shield them from direct sunlight. Why? To improve taste. 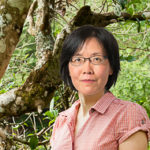 It turns out that while warmth and sunlight are important for increasing the rate of photosynthesis that helps a plant grow faster, photosynthesis also slowly converts a key amino acid in tea leaf, called L-theanine, into the bitter-tasting catechins. Shading preserves more L-theanine, which adds to Gyokuro’s savory light sweetness. It also reduces the amount of catechins produced, which tempers astringency and bitterness. 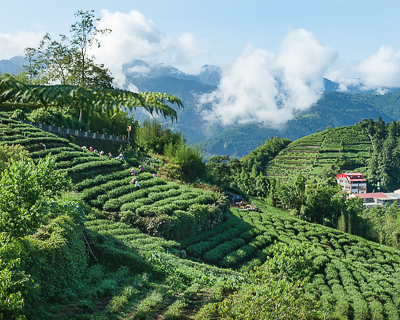 In Shizhuo, instead of farmers erecting canopies, the daily blanket of fog shades the plants and brings in the moisture that tea plants love and need. 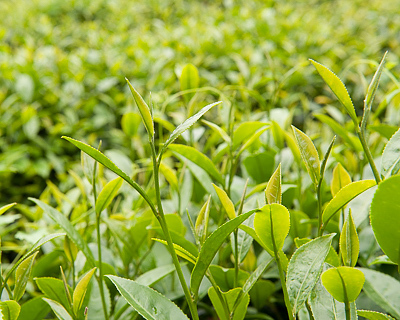 The resulting abundance of sweet morning dew inspired the tea’s name: Zhulu. 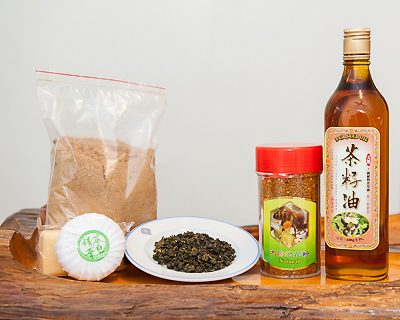 Zhulu tea, tea seed oil and tea seed powder from Deng’s tea garden, plus tea soap and pollen produced by his neighbor. Tea encompasses more than just the taste—that’s a key reason why us tea enthusiasts are so enamored by it. Deng’s Zhulu tea is one such example. It’s about a father and a mother’s belief in their children. It’s about a man’s love for his hometown. It’s about the beauty of people from diverse backgrounds working together to overcome challenges. It’s about—and for anyone whose career path has ever intersected seriously with the world of business would understand how rare and precious this is—friendships that last. And it’s about the mighty sky over a small town, its morning dew and the half-day sun. All that, in a simple cup of tea. 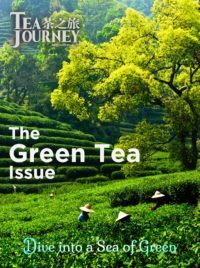 This is a great article, and I’ll be linking to it in an upcoming article I am writing on Alishan tea. I’d just like to point out that the town’s name is Shizhuo, not Shizhao. Thank you for sharing! Hi, Nick. Glad you like my article! And thanks for your comments about the English spelling of the town. I’ll keep it “Shizhuo” for now because it seems to be the most common spelling – but mentioning “Shizhao” in one sentence, just in case the readers have read it spelled as such somewhere. Hi, I sent in a comment yesterday. After further research, I’ve found that Shizhuo is sometimes spelled Shizuo and Shizhao (the latter appears on GoogleMaps). I have confirmed with Taiwanese Mandarin speakers that the second character, 槕 is indeed pronounced “zhuo” in regard to this place name, and that seems to be the most common spelling in sources about the area related to tea, while zhao seems to appear in travel sources that likely refer to GoogleMaps.